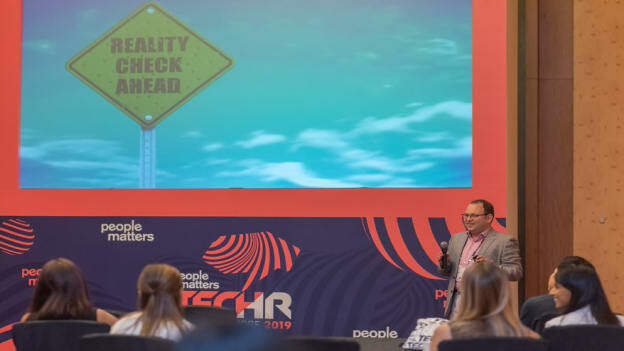 In an insightful session at TechHR Singapore, 2019, John Kostoulas, Senior Research Director of Human Capital Management at Gartner highlighted the gap between what organizations are doing now for diversity versus what research suggests should be done. The three hands that went up the air when John Kostoulas, Senior Research Director of Human Capital Management, Gartner asked delegates in his session at TechHR Singapore, how many belonged to organizations that practice diversity and inclusion in the workplace showed how much more needed to be done. John highlighted the gap between what organizations are doing now versus what research suggests should be done. Currently, organizations are focused on getting the diversity metrics right; whereas, research shows the focus should be on the business impact, decision-making, and innovation. The narrow view is encapsulated on the definition of diversity, which doesn’t usually go beyond gender or ethnicity. Research, however, shows that diversity and inclusion are equal in importance and are multi-dimensional. Organizations also put too much emphasis on bias awareness training, putting the onus on individuals contrary to what research suggests that it should be the organization as a whole that should mitigate unconscious bias. Many business leaders are seeing D&I as something that HR owns and they don’t have to sweat about. “Diversity fuels customer intimacy. When we tap into the full spectrum of talents that reflect the diversity of the market we serve, we raise our ability to serve with empathy. When we intentionally include diverse thinking into our daily interactions, we enable creative solutions to lead in our industry AND nurture a safe environment for our people to be authentic, play to their strengths, unleash their full potentials,” Jacinta Quah, Founder and HR Tech Consultant at JQ Coaching and Consulting, posits based on years of working with tech companies. To go beyond the typical diversity metrics, John challenges companies to look at both obvious and non-obvious aspects of diversity. The legacy diversity, as John calls the obvious aspects: physical attributes, gender, national origin, religious beliefs, are the tip of the iceberg. The non-obvious ones are Style Diversity (how a person performs tasks) and Thought Diversity (how an individual forms ideas and solves problems) require HR personnel to deliberately to bring them to the fore. “We must be data-driven, instead of relying on intuition,” said John. To do that, technology is required to scale D&I enablement. There are a number of providers in the market offering various software that can assist companies in the various stages of recruitment as well as employee engagement, from cross-processing, recruiting, performance and goal management, and career development and succession planning. These software need to be aligned with the framework for scalability. HR personnel must be able to answer and track the implementation of the following questions. 1. Awareness – Is the value of the D&I and the effect of the bias understood across the organization? 2. Input – Are only relevant inputs for decision-making collected? 3. Decision – Are the inputs presented to the decision-maker in a way that mitigates the effect of the bias? 4. Outcome – Is the organization performing consistently well in terms of embracing D&I? Diversity and inclusion will not be easy to implement without clear direction from the organization and a framework for the organization to refer to, to go beyond the typical constructs. But the benefits are clear, as teams will be able to tap into a variety of perspectives and be able to synthesize them into sound business decisions, at the lowest level, every day. They effectively become a mini-board of directors as the fast pace of today's business requires. Sheila Berman is the Marketing Director at All Black Ventures.